Ever since I started riding my bike to work, life has been grand. I get some exercise while I take care of my commute in a shorter amount of time and with a very low level of stress. I am reducing my “carbon foot print” and saving a bunch of money on “T” fare. The best part is - I feel great! Not only do I have more energy during the day, but when I go out on a bike ride on the weekends with friends, I am a stronger rider. I am not alone as a bicycle commuter here in the city. There has been an initiative in Boston to make the city easier to navigate by bicycle. 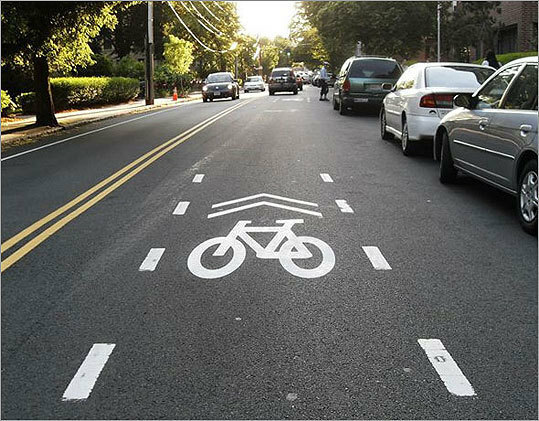 With the addition of more bike lanes and a focus on education, great strides are being made to allow those of us who are a little timid on a bike to pedal around town a bit more comfortable and safe. For more information about events, safety, improvements and other resources, click here. Here at OMBE we are dedicated to being eco-friendly AND helping you achieve your personal transportation dreams. If you already use your own body power to get to work, we can help you stay in tip-top shape. If you are having trouble getting places the way you want to, let us know and we can help your body. If you need advice on the logistical challenges, we may even be able to give you some pointers in that department too! By decreasing stress, improving cardiovascular health and making the smile on your face grow, biking to work really has the potential to do great things for you, your friends, your family and the planet. Now, doesn't that sound nice? Kim became introduced to yoga at a young age, attending her first class at age 13. Once in college, she started practicing more regularly and began to notice the benefits of yoga in other aspects of her life. Wanting to learn as much about yoga as she could, she traveled to the origin of yoga to complete her training. Kim completed her 200-hour Hatha Yoga training at Kasi Yoga in Southern India. From here, she went to teach yoga at a wellness center in Thailand, until she relocated to Boston. Her classes are geared towards relaxation and deep stretching. Her classes are slow paced, but challenging with an emphases on connecting the movement with the breath and finding inner peace. Kim additionally holds a Bachelors of Science in Environmental Science. She also is a professional scuba diver. In her free time she enjoys photography and hiking.